It was spring 2018, and as the Institute of Politics (IOP) at the University of Chicago looked ahead to the midterm elections in November, they also looked back at their voter turnout rates in 2014 and 2016. With 50 percent of eligible UChicago students having voted in 2016 and only 19 percent in 2014 (according to their NSLVE reports), there was a lot of work to do. But by launching a campus-wide, student-led voter engagement program, UChicago would go from a school floundering at voter registration to first in the country on TurboVote’s campus leaderboard. It started with an ambitious goal: 70 percent registration among eligible UChicago students and 40 percent turnout rate on Election Day. And with an unforgiving quarter system that puts the first day of school on October 1—barely a month before the midterms—the IOP knew key components of their plan had to be underway before school started. IOP staff spent four months from May to August meeting with University leadership, administration, and campus partners, building ties with everyone from the registrar’s office to housing and dining, from graduate schools to the Center for Leadership and Involvement. The purpose of these meetings was three-fold: 1) to ensure the IOP wasn’t duplicating efforts, 2) to get advice on best practices, and 3) to secure support at the staff/faculty/administrator level for when students would return in the fall. IOP staff found that the most productive conversations required setting specific goals with each campus partner. Making concrete asks with defined timelines, such as connecting the IOP with five student leaders invested in voting or including a message in their next weekly newsletter, was vital toward spurring stakeholders into action. The registrar was especially helpful by incorporating voter registration through TurboVote into UChicago’s course confirmation process, a mandatory checkpoint for all students: undergraduate, graduate, and professional. While the IOP’s work in the spring was crucial toward gaining traction and securing buy-in, they knew that the campus-wide push they needed to create a cultural movement around voting would only be successful if it was truly student-led. And so, UChiVotes—a student-led, nonpartisan voter engagement initiative—was launched in August, headed by a group of 20 of the IOP’s most engaged students. At the outset, the students knew failure was possible (nothing like this had been attempted at UChicago before), but they were excited by the idea of a blank slate. UChiVotes student leaders got started with conference calls over the summer to discuss an action plan for the coming academic year, even while some students were still at their summer internships. In September, student leadership launched UChiVotes’s online presence with a website, Facebook page, and Instagram account, which quickly began to amass interest and followers. The group began brainstorming an enormous checklist of projects, events, and ideas big and small to execute in the fall; everything from ordering swag to kickstarting a “Pledge to Vote” competition among campus groups. “Pledge to Vote” would soon become a campus-wide movement that led to more than 1,000 pledges across greek life, RSOs, residential houses, athletic teams, and more. As October neared, students started flooding back to campus and UChiVotes began putting their long list of ideas into action. During orientation week, students tabled across campus, including at the IOP’s Politipalooza and a variety of other fairs for undergraduate and graduate students. The team planned additional tabling and marketing opportunities throughout October, including UChiVotes displays featuring UChicago’s TurboVote link posted around campus bottlenecks like residential common areas and dining halls. The IOP also sent out a series of six emails to the UChiVotes distribution list of more than 4,000 people, which included those who had signed up for TurboVote and the more than 1,000 students who submitted "Pledges to Vote" from various student organizations. The emails highlighted important dates and deadlines related to the election as well as upcoming UChiVotes events. In tandem, UChiVotes carried out a widespread social media push, featuring videos from the likes of Joe Biden, Khizr Khan, David Axelrod, and even members of the Dancing with the Stars cast. Embracing a grassroots approach, one student decided to distribute more than 1,600 goodie bags to students in the dorms to encourage voting, staying late at the IOP to stuff the bags with treats. The simplest but perhaps most effective tactic the group employed was having the IOP supply free stamps and envelopes for students to request or mail in their ballots. Hoping to bring even more students to the table, the IOP Civic Engagement team and Democracy Works staffer Emily (a Chicago resident) held a series of info sessions to recruit and train Voting Ambassadors. The Ambassador program provided students an easy way to plug into the initiative by staffing events and promoting UChiVotes among students in their diverse range of campus affiliations. Training sessions covered the overarching mission and goals of UChiVotes and concluded with a discussion of the do’s and don’ts of voter registration. More than 100 students completed the training, and the Ambassadors were instrumental in UChiVotes’s success. In the future, Jenny plans to share a list that offers things to do post-training—not having immediate tasks meant many students dropped off, and not all of them were engaged when volunteers were needed. Another big win in 2018 was a result of the early legwork of the UChicago Democracy Initiative (UCDI)—a nonpartisan, student-led organization that plugged into the UChiVotes initiative in the fall. Thanks to their efforts, UChicago hosted an on-campus early voting site from October 31 to November 2. Voting Ambassadors placed more than 30 yard signs around campus to promote the polling place, and a total of 1,039 people voted over the course of those three days. An on-campus early voting site was only one piece of the puzzle, but like the free stamps and envelopes, it mitigated yet another roadblock student voters face. 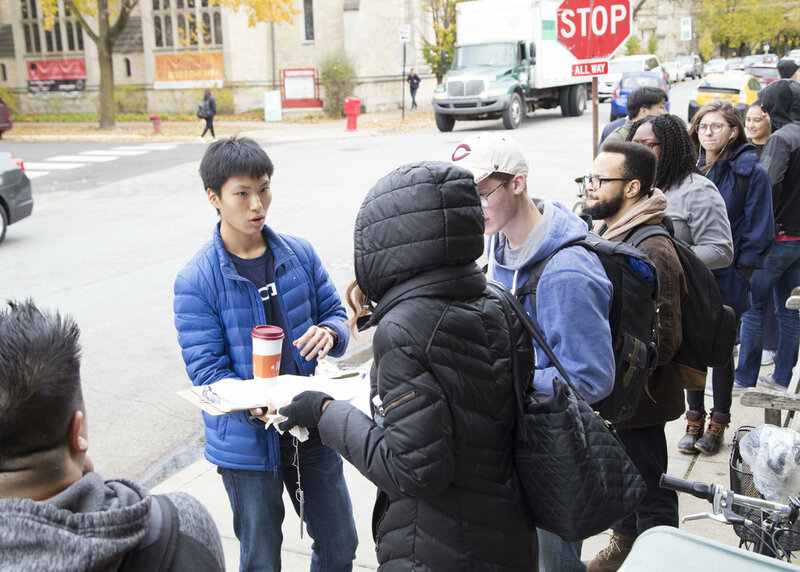 Come Election Day, the combined efforts of IOP staff and the students of UChiVotes resulted in nearly 5,000 TurboVote signups in 2018; that accounts for approximately 80 percent of the undergraduate student body, making UChicago the #1 TurboVote campus nationwide in terms of percentage of students engaged. But TurboVote signups were just one metric of this campaign’s huge success. All of the hard work poured into the many facets of the UChiVotes initiative led to a surge in youth voter engagement big enough that the community took notice, too (see: NBC 5 Chicago, Chicago Sun-Times, even USA Today). And with citywide elections happening in Chicago in 2019, UChiVotes has no plans of slowing down.